Get off that negative treadmill — and get on with the richness of life! So that whatever happens to your relationship you’d still feel stable and comfortable, with a strong sense of self, knowing that whether your partner remained with you or left, you’d have a lot going on in your life to be able to enjoy it no matter what. These feelings of inner confidence, security and independence will further boost the chances of lasting and fulfilling relationship. No-one who has experienced extreme jealousy needs to be told what it can do to a relationship. Whether you are the jealous partner, or are on the receiving end, jealousy can devastate a relationship. And although if you are very jealous, you know what you are doing is wrong, it often seems impossible to stop. All jealousy is caused by an over-active and misused imagination. Creating scenarios in your mind of what your partner is thinking or doing is the perfect way to torture yourself. Yes – however horrible it feels, it can be almost compulsive – it can feel impossible to keep the jealous thoughts from your mind. This Stop Jealousy Hypnosis MP3 session will help you get control back over the workings of your imagination so it stops feeding you images of the worst happening. Your partner will be astounded, (and probably overjoyed!) at the new, relaxed, realistic you. Steve G. Jones, Ed.D., Clinical Hypnotherapist, charges $1,500 for a custom recording and $25,000 for a one-hour private hypnotherapy session at his office. but you can get all the benefits for this low price. Simply listen to the Stop Jealousy Hypnosis MP3 audio every night as you go to bed for three weeks and feel the changes happening in your life. You will feel more empowered, more in touch with your true self, and you will truly know that your goals are within your reach. A jealous person is defined as being disposed to suspect rivalry or unfaithfulness. Feelings of jealousy can come out in the form of anger and sadness. Jealousy is a natural and a learned instinct, but it is important to control feelings of jealousy before they get out of control. If you often have feelings of jealousy, I encourage you to explore different ways in which you can overcome jealousy. It will take time and effort to conquer these feelings, but your relationship with yourself and others will begin to improve. Often time, thoughts of jealousy are negative. When you find yourself thinking these negative thoughts, you must replace them with positive thoughts. Over time you will train yourself to immediately think positive thoughts rather than jealous thoughts. And as you continue relaxing deeper, deeper and more deeply relaxed, you realize just how powerful you are. You are a wonderful, amazing, powerful, beautiful person. You have all of these qualities and you always have and you always will. You are emotionally stable no matter what. You are mentally stable no matter what. You are physically stable no matter what. Think of yourself like a large ship on the ocean, a large powerful, beautiful, wonderful ship on the ocean. And no matter what storms come, no matter how high the tide may be, no matter what other ships are doing around you, you remain stable and constant. And you continue moving in the direction of success. Certainly in the past you have had periods of time in your life when you felt jealous. That was normal for you, but now as you embrace your true power, as you accept this metaphor of you being like this ship, stable, forward moving, unshakable, you realize that you are letting go of jealousy forever. Because no matter what happens in the sea of your life, you remain stable, always moving in the direction of success. There will always be a new sunrise, a new day, a new opportunity. And so you remain hopeful, very hopeful. And your hopefulness is rewarded because you realize that by maintaining a positive attitude you will get what you want. So you remain stable emotionally, mentally, and physically. You continue to think of yourself as this large, powerful, beautiful ship on the water. You keep hope alive in your heart and you realize that a person who does all of these things cannot be jealous. So you let go of jealousy forever, just let it go. Jealousy is so far beneath you. Jealousy is so far behind you. Let it go. See it there bobbing in the water and then being taken under as the ship of your life continues moving forward. Jealousy has sunk, it is gone. You are no longer able to feel jealousy. So let it go forever because you have thrown it overboard. You have kicked jealousy out of your life. And it has sunk to the bottom of the ocean floor where it will remain forever because you are now and forever more a very powerful, wonderful, beautiful, forward moving person who always sees the possibility of a new and glorious day. What you see in front of you is something glorious, something wonderful and that thing is opportunity and possibility. The logical results of your positive thinking, the future, beautiful, wonderful, infinite that you will create as a result of your positive thinking. You know that you can and will continue your success. Success is what you are all about. You like it and you know it. Success is what you are all about. You are success. You like success. You like it and you know it. So the ship of your life continues moving forward into success and you leave jealousy far behind at the bottom of the ocean. And you look for new and exciting opportunities. Jealousy consists of negative thoughts and emotions, such as envy and anger toward another person. Just like all emotions, jealousy is controlled by your subconscious mind. Hypnotherapy is a great tool to use because hypnosis targets your subconscious mind to overcome feelings of jealousy. Whether your jealousy is over a relationship or an specific thing, this powerful hypnosis recording will help you! In most cases, there is no reason for you to feel jealous. 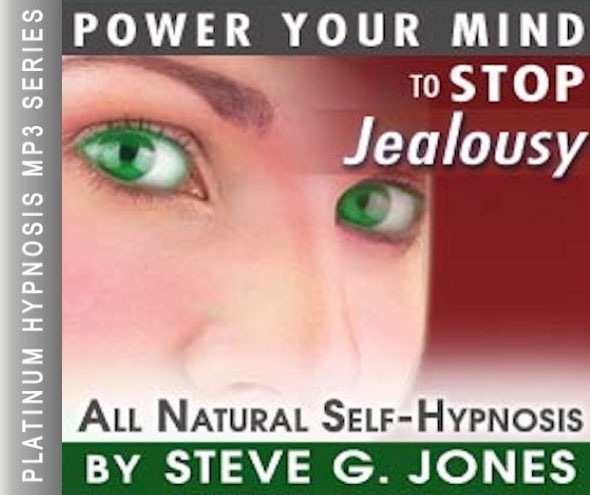 Hypnotherapy will help you see that jealousy only brings you negative emotions. This hypnosis session will help you let go of your jealous feelings and allow positive emotions and reactions to take its place. 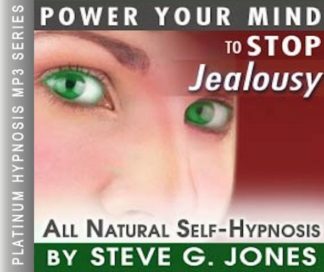 The Stop Jealousy Hypnosis MP3 recording will help you get rid of your negative feelings of envy no matter what the cause. You deserve to live a peaceful life full of positive thoughts and emotions. Hypnotherapy will help you achieve calmness and tranquility in your life!